Are you looking for something extra special to add to your yard next spring? Outdoor water features have always been an exciting and welcoming addition to backyards. They are often very calming as well as decorative, and water of any sort is perfect for creating that ultimate outdoor retreat. Even if you already have a water feature but are looking for something different, you may be interested in these fresh and new ideas for your backyard retreat. What could be fresher than a natural pond? A natural pond is very suitable for many types of gardens and backyards. A natural pond brings on the feeling of being very relaxed as well as being very informal. These water features have their very own unique appeal as well as charm. If you want to go with a more formal feel, the terrace pond is designed to be more practical as well as being more formal. A terrace pond saves space if you have a smaller yard while still providing the comparable properties of any water feature. If you do not have a terrace, a deck or even a bridge may be used and the pond can be as large or small as you would like it to be. For smaller spaces, add a little something new and exciting like a table fountain. A table fountain features a running stream that is located in the tabletop and the water falls into a pond or a pool of water at the bottom. You may appreciate the sound of the waterfall as you sit by the table with some of your closest friends, or just relaxing reading a good book. 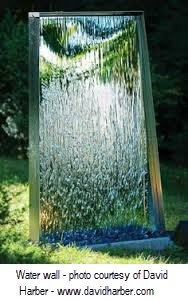 A water wall (or another way of seeing it is a water curtain) feature includes a showy, artistically impressive water fountain alternative. Some water walls are in fact actual walls, but if you’re looking for something unique, choose what is known as a frame fountain. A frame fountain lets the water flow easily like a curtain instead of dripping down a wall. This leads the focus to be on the movement of the water instead of what the wall is made out of. In more cases than not a wall fountain focus is on the wall itself. (The photo above right is a frame fountain.) The water wall has many variations, so you will be able to choose the best option that suits your own backyard by size and the style which you love. To add a unique touch to your yard next spring, speak with us here at Architectural Landscape Design to discuss all of your water feature options! We can get the design process going right now so you’ll be all ready to have that water element installed in your yard as soon as spring gets here.